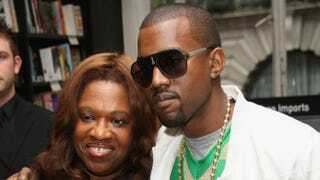 Kanye West poses with his mother, Donda, in 2007. In an interview with Q magazine, Kanye West opened up about a woman and a little girl in his life who are both very dear to him: his late mother, Donda West, and his 2-year-old daughter, North West. Climbing to the top of the charts is no small feat, and it can take a toll on your personal life, but it can be especially painful to see the toll that success takes on the lives of your loved ones. When asked what has been his biggest sacrifice to date, he immediately said, "My mom," and then alluded to how Donda West would never have gotten the plastic surgery that resulted in her death if not for Kanye's success and being in California. "If I had never moved to L.A., she'd be alive," Kanye said. His mom's death is still a touchy subject for him—he refused to elaborate, but he didn't have to. Donda died in 2007 at the age of 58 from heart disease after undergoing an operation in Los Angeles that reportedly involved liposuction and breast-reduction surgery. "I don't want to go far into it because it will bring me to tears," Kanye said. Kanye also talked about his baby girl, North. Even though people see him trekking around the globe on tour, recording music, shooting videos, designing clothes or sitting front row at fashion shows, he said that he plans his meetings and professional commitments around North's schedule—not the other way around. "While [North's] here in Europe, I have to have six hours a day with her because otherwise I'll just work and she'll get scheduled around meetings," he admitted. "Instead, the meetings get scheduled around her."